You’re in a common industry and you have tons of competitors; how can you capitalize on more opportunities that come your way? How can you attract more buyers than your competitors or win business even though competitors are undercutting you? How can you make sure you have clients who remain loyal to your company? How can you generate more referrals? How about attracting bigger deals? The answer is quite simple. In my time here at CHI, I’ve personally spoken with more than 7,000 business owners and executives who are looking for help in their business. There is one common denominator among those who are dominating their market—thriving in a down economy versus those struggling to stay in business or flat-lining in growth. That one commonality is training. Only 10 percent of the population has what’s called “the learning mindset” according to Harvard Business Review. If there is any one X factor that has significant impact on your business, it’s training. Harvard Business Press even published a book on the importance of training to be successful in today’s global economy. The bottom line is that consistent training has proven time and again to get bigger results. We’re in football season right now, so I’ll use a sports analogy. Your favorite team makes its money on the field during game day. But where does the success really come from? How would you feel if you found out that your favorite team doesn’t practice during the week because they are extremely confident that they can perform when necessary? You wouldn’t be thrilled and you’d probably expect them to play poorly against a competitor who has been training relentlessly. This is why the best running backs train beyond what is expected of them during the off-season, i.e. Adrian Peterson or Matt Forte. Most professions (like accountants, financial planners, attorneys, and healthcare professionals) are mandated through steadfast certifications to continue their education in their related field. I’m sure you wouldn’t want to use an accountant who is not up-to-date with their understanding of current tax laws or a physician who hasn’t kept up with medical advances and technology. The same is true of your own business. However, I’d like to focus on one of the most important growth and survival aspects of your business; sales and marketing. Many of our sales and marketing concepts work with great success for the vast majority of our clients, yet some have said they just didn’t work for them. When I’ve asked them how much time they have spent dedicating themselves or their staff to becoming masters of their new resources, they come clean with me saying they trained on it once. 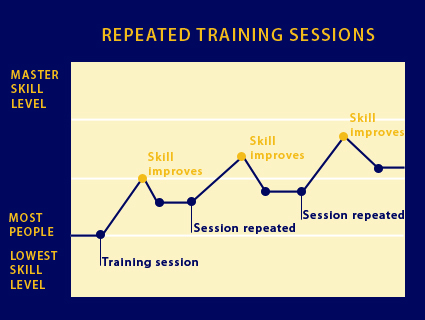 When you train on a skill, you have some improvement in that skill that is retained and some that drops off. The more you train, the more you can expect to increase in skill level. The majority of small business owners don’t consistently focus on training and improving the various impact areas of their business, such as marketing activities, customer service, sales teams, or partner relations. When you spend just one hour per week training on a few areas of your business and only make a 1% improvement, it actually translates to significant long-term gains.